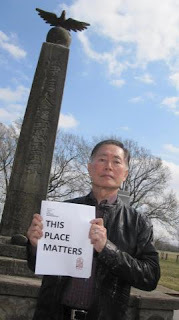 On Friday, this photo of George Takei at the Rowher Internment Camp in Arkansas came up on my Facebook feed. The image, combined with my current research on marine science illustrators, led me to think about why internment camps, and the history of immigration, matters greatly to both the history of science, and to individuals who may be interested in pursuing scientific careers in today. Betty Smocovitis has written a paper on the impact Masuo Kodani's status as a Japanese immigrant had on his career as a geneticist in the mid- 20th century. Unlike other immigrant groups, Japanese immigrants had less support structure within the United States, and during WWII this lack of support lead to a drastically different war experience. Kodani was born in California and was a citizen, but his wife was a Japanese citizen (they met as students at Berkeley), and the Kodanis were interned at Manzanar during the war. Masuo continued to work on genetics in Manzanar and published work with Ledyard Stebbins. His experiences during the war were difficult, but the end of the war did not alleviate his suffering. Continued stress over the threatened deportation of his first and second wife lead to an unstable career after the war. In response to threats of deportation, the Kodanis moved to the United States, back to Japan, and after his second marriage, eventually to Columbia, Missouri- a career trajectory based, not on new and better opportunities but fears of deportation. Masuo's experience during and after the war are mirrored by those of a man I have been studying, the scientific illustrator Hashime Murayama. Unlike Kodani, Murayama was a Japanese immigrant, as was his wife. He came to the United States in 1905 and married his wife Nao in New York City in 1910. His sons were born in 1911 and 1919. The Murayama family in 1925. Hashime was hired by National Geographic as the first staff illustrator in 1921. Known for his meticulous attention to detail combined with a romanticized style, his paintings were printed not only in National Geographic but in other scientific publications. While little information exists on Murayama's work before or after WWII (although his paintings are readily available online- google him and you'll find little or no personal data but loads of beautiful watercolors being sold as prints), some stories survive. 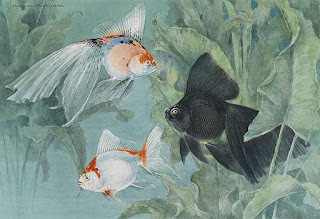 In Alice Carter's book on the history of illustration in National Geographic, she tells the tale of the Hashime's visit to the New York Aquarium to view living trout and salmon for a new illustration. The director of the Aquarium, Charles Townsend, had fresh fish brought in for Murayama to paint, but all of the fish died within days because the water temperature was too high. Despite the difficulties, Murayama produced amazing images from living specimens (see the one above). In 1941, Hashime was fired from National Geographic because of his immigrant status (even though, similar to Kodani's biography, his German immigrant counterparts were not fired) . He was interned with his family twice during the war- although little information exists about where they were relocated. These internments were short; Hashime's work with George Papanicolaou was considered important to American health and therefore a priority by the government. 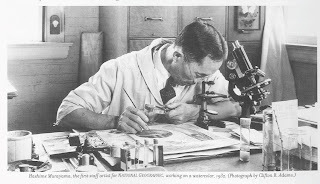 Before his work at National Geographic, Murayama worked at Cornell illustrating cell cultures. As Papanicolaou's work on cervical cancer accelerated during WWII, he chose Hashime to illustrate the cultures. It was this highly technical work that kept the family out of relocation camps- but the damage had already been done to his career path. It is somewhat easy today to find Murayama's marine illustrations; it's equally as easy to find his name in academic publications written by Papanicolaou who never failed to give Hashime credit for his amazing illustrations--but Murayama's accomplishments and his role as one of the principal scientific illustrators of his generation have been largely forgotten. In some sense, the fading of Murayama into history involves the change in his work during and after the war. Before he was fired from National Geographic, Murayama was a scientific illustrator, but in a certain sense he was also an independent artist. His style and his paintings were utilized in multiple ways- not just magazines but scientific publications and as stand-alone art. Hashime signed all of his work, a detail that is telling. His work, which is today sold in print form as "art", was also regarded in the early 20th century as both "art" and "illustration." Murayama in his studio at National Geographic. Known for his meticulous but romantic painting style, many of his scientific illustrators were also seen as stand-alone artwork. Carter, The Art of National Geographic, 18. Because of his immigrant status and treatment during the war, Hashime Murayama switched careers- from somewhat independent artistic illustrator to cell culture illustrator and an extension of the scientist's toolbox. Murayama was able to utilize one aspect of his artistic ability, his highly meticulous eye, but his romanticized vision of nature was stripped from his work. Hashime didn't sign his cell culture drawings for Papanicolaou, and even though he was acknowledged continuously be the researcher for his efforts, his work later in life failed to achieve the vision, or the personal freedom, exhibited by his work before the war. In fact, his images of cell cultures don't come up readily in google images and must be accessed in the papers for which they were published (Papanicolaou and Trout, 1941). Most of Murayama's drawings for Papanicolaou's research remained behind the scenes- part of the scientific process of understanding cervical cancer smears- not meant for public consumption. Murayama's biography is the exact opposite of many scientific illustrators during this period. Individuals like Charles Bradford Hudson and Charles R. Knight went from operating as an extension of researchers' tools to painting independently as naturalistic artists with a developed vision of their own. Hudson and Knight were lauded for their artwork later in life and considered themselves independent artists, not scientific illustrators, during their final years. Murayama had found the success of an artist before the war, but due to his immigrant status, was pushed back into the laboratory work out of which he had advanced years before. Kodani and Murayama's biographies highlight the importance of internment and immigration research to the history of science. Both men experienced life altering events during WWII- not necessarily based on their experiences within these camps, but the changes in life course and career course that their immigrant status imposed. We must ask ourselves, what is the proper path through a scientific career? And what happens when that path is upset by circumstances beyond a person's control? If it is the case that the scientist or scientific worker must follow very specific paths through their career in order to achieve certain status, and those that are derailed are relegated to sideline, but still highly important, positions- what might this say about the role of race, class, and gender in science?